Canadian astronaut Chris Hadfield floats inside the International Space Station clad all in green for St. Patrick's Day on March 17, 2013. You don't need gravity to have a great St. Patrick's Day, just ask astronaut Chris Hadfield on the International Space Station. 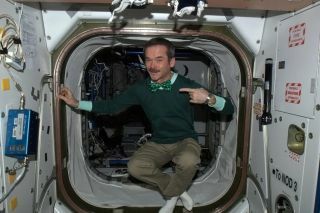 Hadfield, a Canadian Space Agency astronaut, is celebrating the Irish holiday in orbit by wearing a green shirt and a bright green bow tie today (March 17) while photographing Ireland from space. "Maidin mhaith from the International Space Station! Happy Saint Patrick's Day to the Irish all around the globe. Good morning!" Hadfield wrote in one of several Irish-themed Twitter posts today. Maidin mhaith is Gaelic for "Good Morning." "Danny Boy strikes home with me now more than ever. I've recorded a version for today in orbit," Hadfield wrote. He posted his version of Danny Boy on the Soundcloud.com audio website. Canadian astronaut snapped this photo of Tralee, Ireland, from space on March 17, 2013, to celebrate St. Patrick's Day on the International Space Station. Hadfield is an accomplished guitarist and is the first astronaut to record an original song in space. Last month, he was one of several astronauts to perform with the Irish band The Chieftains during a Feb. 15 concert in Houston. NASA astronauts Cady Coleman and Dan Burbank joined the Chieftains live on stage during the concert, with Hadfield prerecording his portion for the show. Coleman also performed with the Chieftains from space during a mission to the International Space Station that ran from December 2010 to May 2011. She took five different flutes to the space station and also performed an Irish song in space for St. Patrick's Day. Canadian astronaut Chris Hadfield (top left) and NASA astronauts Cady Coleman and Dan Burbank (in blue flight jackets) perform with the traditional Irish band The Chieftains on Feb. 15, 2013, at Jones Hall in Houston during the bands 50th anniversary tour. Hadfield prerecorded his portion on the International Space Station. Hadfield commands the Expedition 35 mission on the International Space Station and took charge the orbiting lab last week when the previous Expedition 34 crew returned to Earth. He is the first Canadian ever to command the space station. The space station's Expedition 35 crew consists of Hadfield, NASA astronaut Tom Marshburn and Russian cosmonaut Roman Romanenko. The three men launched to the space station in December and are due to return to Earth in May. Hadfield and his crew will welcome three more crewmembers on March 28, bringing the space station back up to its full six-person crew size. You can listen to Chris Hadfield's version of Danny Boy on SoundCloud.com here. Email Tariq Malik at tmalik@space.com or follow him @tariqjmalik and Google+.Follow us @Spacedotcom, Facebook and Google+. Original article on SPACE.com.